Sip a frothy latte. Savor a perfectly grilled steak. Dive into a juicy burger or a few tacos sabrosos. Indulge in a luscious gelato. The menu at Montecillo is filled with delectable options, with more on the way. Serving lunch and dinner everyday, and brunch all day Saturday and Sunday. Full bar and great happy hour menu available, along with plenty of seating in the main dining room and patio. In addition, a 40 seat mezzanine upstairs for private parties including an upstairs patio makes for your everyday grill! Lifestyle coffee shop Donuts. Breakfast. Lunch. & lots of Coffee. Malolam Cantina serves up tacos, ceviche, cerveza, and more cerveza! A full bar and an upbeat authentic cantina atmosphere. 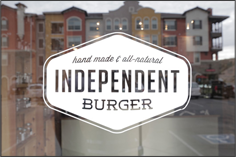 At Independent Burger we have one passion, and that’s keeping it real. Real Natural. So naturally we only use the freshest, 100% grass fed beef that we grind daily. Our chicken and turkey are free range and free of hormones, steroids and cage free. All our bread is baked daily here with the freshest ingredients, from wheat to gluten free. The organic produce we use is locally home grown and cholesterol free, TFF and micro-nutrient rice bran oil in our fryers for our natural, organic hand cut fries. We make Gelato the old fashioned way, using the highest quality materials available. We never use premix, no fillers, no artificial colors or flavors. At Gelateria Gufo di Milano we don’t garnish our gelato with fruits and nuts, we put the fruit and nuts where it counts, in the gelato. 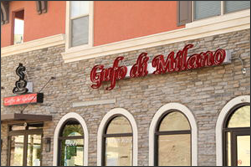 Authentic Italian gelato, since 2008.